Silverstrand - Silverstrand Beach is just 7 minutes drive from the hotel with a safe, shallow, sandy beach of approximately 0.25km bounded on one side by a cliff and the other by rocks. It is particularly popular with and suitable for young families. It faces directly into Galway Bay, giving spectacular views. There is a promenade with parking capacity for about 60 vehicles. It is suitable for swimming at low tide but the beach is largely covered during high tides. It is lifeguarded during the summer months. Salthill - Salthill Beach just 10 minutes drive from the hotel is actually several small beaches separated by outcrops. Some of the beaches are sandy and some pebbly. It is located in Galway city and overlooking Galway Bay, a Special Area of Conservation. The beach is lifeguarded from mid-May to the end of September from 11am to 7pm. Salthill beach has been a blue flag beach and enormously popular in fine weather during the summer. Carraroe Beach Carraroe beach 40 mintues drive from the hotel is also known as Trá an Dóilin, is an area of great natural beauty. The beach is noted for its very fine coral. The beach is lifeguarded and has toilets throughout the bathing season. There are lots of little rock pools to explore along with good snorkling and is usually less busy that the city beaches. Dogs Bay/Gurteen Bay Lying back to back, Dogs Bay and Gurteen Bay are two of the most beautiful beaches in Co Galway and probably in the West of Ireland. They are situated only two miles outside the picturesque village of Roundstone in Connemara. Dogs Bay and Gurteen Bay make up one of the finest stretches of coastline in Connemara, offering uncompromising views of Errisbeg and the surrounding countryside. Both beaches are well sheltered from currents anare considered safe for swimming and other watersports such as windsurfing and kitesurfing. Dogs Bay and Guerteen Bay are 55 minutes drive from the hotel but well worth a visit!! Carraroe Beach Carraroe beach, which is also known as Trá an Dóilin, is an area of great natural beauty. The beach is noted for its very fine coral. The beach is lifeguarded and has toilets throughout the bathing season. There are lots of little rock pools to explore along with good snorkling and is usually less busy that the city beaches. 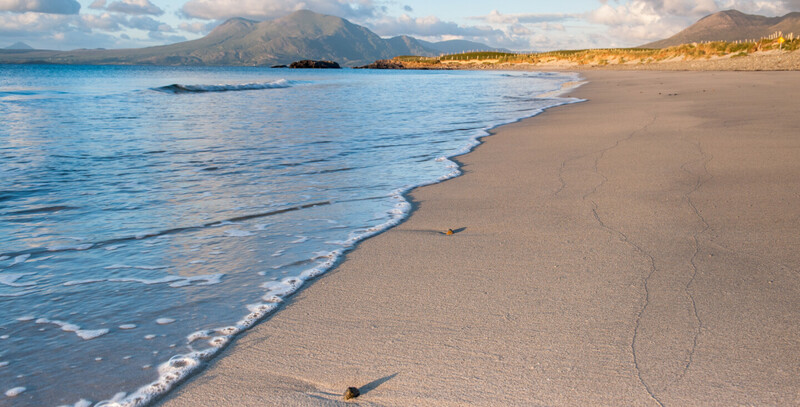 Enjoy all the beaches about with their idyllic scenery when you stay at the 4 star Connemara Coast Hotel.